Last night I cooked a dish which left me with polenta left over as I cannot stand wasting food I put it into the fridge for today, in Italy polenta is often fried or grilled the next day, so I then had to go through the fridge and find something to put with my grilled polenta and that is how my different mixed grill came about. I used a griddle pan but it will work just as well under the grill, the other main ingredients are halloumi cheese, raw chorizo sausage, cherry tomatoes, rocket, John commented it was one of the best lunches he has had in a long time, so I hope you give it a try. 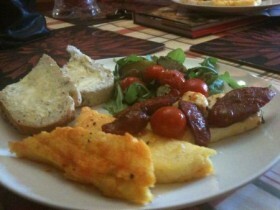 Serve the cheese and polenta onto the plates and put the sausage on top so the oils run over the cheese and polenta.